It can spot enemies from a range of 390 meters, cover the distance in a flash, and act as a perfect distraction. The speed demon AMX 13 57 is ready to rumble and roll out in battle. You can find this vehicle in 2 packages below - either with minimal frills or packed generously with in-game premiums. 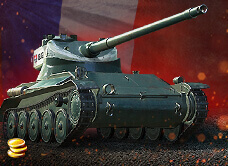 The AMX 13 57 is a Tier VII French light tank. The vehicle is a special modification of the AMX light tank. Its key feature is a long-barreled 57-mm gun with 8-shell loader drum. The time interval between shots is only 1 second, which allows to rapidly dish out 720 HP of damage to the enemy and then retreat for reloading. The AMX is a classic light tank. High maneuverability and a view range of 390 meters make it well-adapted for spotting and raiding. 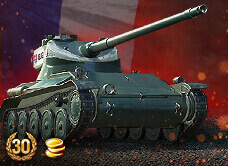 Another pleasant feature is the increased profitability in experience and credits earned and the possibility to transfer crews from other French light tanks without any penalties.